Settings are available for adjusting the contrast and brightness of the screen. Select �display� on the �setup� screen. adjust screen contrast/brightness of the video. 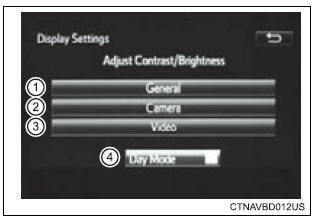 Select �general�, �camera� or �video� on the �display settings� screen. Adjust the display as desired by selecting �+� or �-�. When the headlights are turned on, the screen dims. However, the screen can be switched to day mode by selecting �day mode�. The screen will stay in day mode when the headlights are turned on until �day mode� is selected again.